Congratulations to our men’s and women’s track and field teams. They finished up district competition Saturday with both the men and the women placing 3rd in the district. Congratulations to the following athletes who are moving onto regional competition. The RMS Girls Track team came home with the Championship from the Zane Trace Invitational, while the Boys team finished 5th. 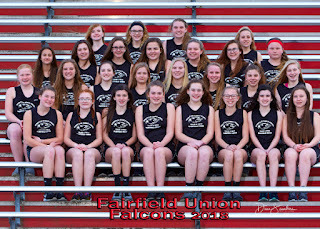 The Girls were led by Zephaniah Dehainaut (1st 200 & 400, 2nd 100), Denae Pickens (1st Discus), Tori Lenhart (1st Shot), and the 1st place 4 x 400 team of Olivia Duffey, Jillian Bennett, Taylor Rife and Alexis Cymanski. Also scoring were Annie Deyo (3rd 1600 & 800), Carley Hanks (5th 1600 & 800), Cymanski (3rd Pole Vault, 7th H J), Cambria Miller (5th 100H), Olivia McCormick (6th 100), Taylor Rife (4th 400), Nella Stansberry (4th 200), Carley Miller (8th 200H), Tori Lenhart (1st Shot), Addison Sharp (3rd Shot), Megan Devall (6th PV), the 2nd place 4 x 100 team of Stansberry, McCormick, Pickens, & Caroline Brown and the 3rd place 4 x 200 team of Devall, Lauren Denny, Jillian Wilkinson, Cymanski. 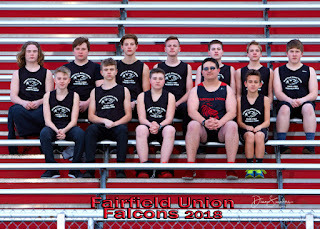 The Boys team was led by Drew Hurst (1st 1600, 2nd 800, 4th 400), Garrett Wyeth (4th Discus, 7th 110H), Barrett Young (4th PV), Tylor Rager (3rd 1600), Wyatt Carpenter (5th Shot), Ryan Williams (6th 200), Seth McCrady (8th Shot), and the 3rd place 4 x 400 team of Mason Taylor, Marcus Runkle, Rager, & Young. Congratulations to both our men's and women's track and field team at their MSL meet on Friday. The ladies won their 4th consecutive MSL title and our men's team finished as MSL runner ups! Both teams are back in action Tuesday night at Meigs high school for the start of their district meet! At the season ending MSL Championship meet the RMS Girls narrowly missed 1st place by only 4 points while the boys came home with a hard fought 5th place finish. Leading the way for the girls was individual champion Alexis Cymanski (1st H J, 2nd P V), Brenna Reed (2nd 1600, 4th 800), Cambria Miller (3rd 100H, 6th 200H), and Zephaniah Dehainaut (3rd 200, 6th 400). Danae Pickens (2nd Shot), Olivia Carpenter (3rd Shot), Tori Lenhart (4th Shot), Megan Devall (5th P V), Annie Deyo (4th 1600), Olivia McCormick (7th 100), Carley Miller (7th 200H), Nella Stansberry (8th 200), 3rd place 4 x 100 team of Stansberry, Pickens, McCormick, Caroline Brown, the 4th place 4 x 200 team of McCormick, Stansberry, Devall, Brown and the 4th place 4 x 400 team of Cymanski, Bennett, Rife, Olivia Duffey. 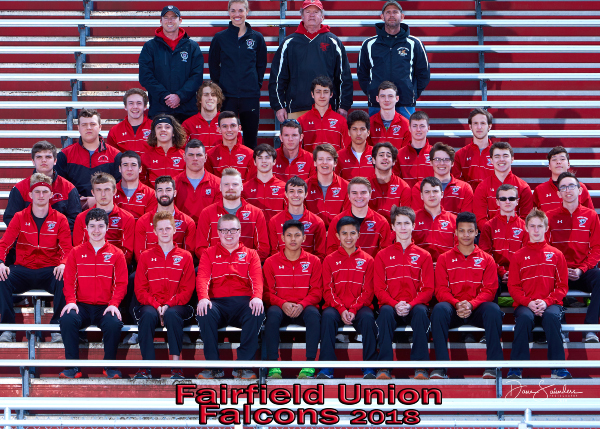 The Boys scoring included contributions from individual champions Garrett Wyeth (1st Discus, 4th 110 H), Barrett Young (1st PV, 8th 400) along with Drew Hurst (3rd 800 & 1600), Wyatt Carpenter (8th Shot & Discus), Tylor Rager (7th 1600), Seth McCrady (7th Discus), Mason Taylor (7th PV), the 5th place 4 x 400 team of Hurst, Taylor, Rager, Barrett, and the 6th place 4 x 100 team of Kyle Walton, T.J. Smith, Matthew Elliott, and McCrady. 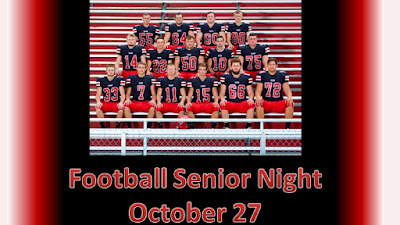 The entire team had and outstanding season and are to be congratulated on all of the hard work that put in to earn everything that they accomplished. Congratulations to both the men and women’s track and field teams for taking 1st place last night against 8 teams. The women won 170-121 and the men won 160-157. Many athletes contributed to the scoring as the Girls finished 1st and the Boys 2nd in a Tri-meet with Bloom Carroll and Teays Valley. Top performers for the Boys included Drew Hurst (1st 800 & 1600), Garrett Wyeth (1st Discus, 2nd 110 H), Barrett Young (1st P V, 4th LJ), Seth McCrady (3rd Discus, 4th Shot), and Tylor Rager (2nd 1600, 4th 200). Others adding to the final score were Wyatt Carpenter (3rd Shot), Matthew Elliott (2nd Shot), Mason Taylor (4th P V), Ryan Williams (3rd 400), Brandon Schmelzer (3rd 200), Marcus Taylor (3rd 110 H), and the 2nd place 4 x 400 team of Hurst, Rager, Young, Mason Taylor). 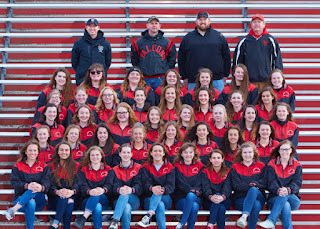 The Girls effort was spearheaded by Zephaniah Dehainaut (1st 200, 3rd L J), Olivia McCormick (1st 100, 2nd 200), Olivia Carpenter (2nd H J & Discus), Carley Miller (4th H J & 200 H), Alexis Cymanski (1st H J & P V), Tori Lenhart (1st Shot, 3rd Discus), Addison Sharp (3rd Shot, 4th Discus). Other scorers included Caroline Brown (2nd 100), Olivia Duffey (4th 200), Taylor Rife (3rd 400), Carly Hanks (4th 800), Annie Deyo (2nd 1600), Katelin Graham (4th 1600), Cambria Miller (2nd 100 H), Danae Pickens (1st Discus), Megan Devall (4th P V), Myah Messbarger (4th Shot), the 2nd place 4 x 100 team of Stansberry, Cambria Miller, Dehainaut, Brown and the 2nd place 4 x 200 team of Stansberry, Rife, Devall, Duffey. At a Tri-meet with Liberty Union and Amanda Clearcreek, The RMS Girls Track team finished first and the RMS Boys Team finished second. 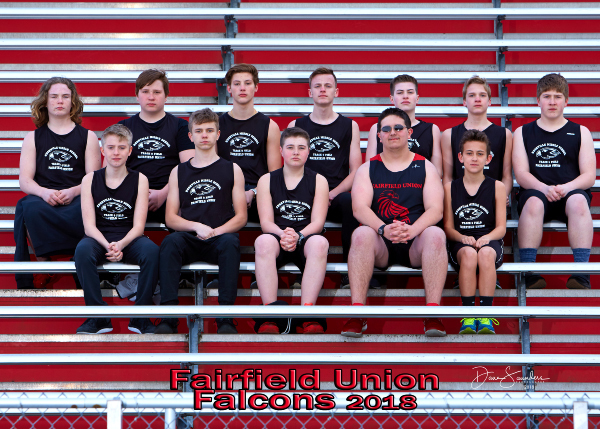 Leading the way for the boys were Garrett Wyeth (1st Discus, 2nd 110 H), Tylor Rager (2nd 1600, 3rd 400), Barrett Young (2nd 400, 3rd Shot Put), Ryan Williams (4th Long Jump), and the 2nd place 4 x 100 team of Kyle Walton, Marcus Taylor, Matthew Elliott, and Seth McCrady. At the A-C Invitational the RMS Girls track team came away with the Championship, their second of the season, while the boys finished tenth. The girls were led by three time scorers Brenna Reed (1st 1600, 3rd 800, 7th 400) and Cambria Miller (2nd 100H, 5th 200H & L J). Others adding to the championship effort included Niah Dehainaut (2nd 100, 3rd 200), Olivia Carpenter (4th Shot, 5th Discus), Tori Lenhart (3rd Shot), Danae Pickens (3rd Discus), Alexis Cymanski (6th H J), the first place 4 x 400 team of Olivia Duffey, Taylor Rife, Jillian Bennett, & Alexis Cymanski, the 3rd place 4 x 200 team of Olivia McCormick, Nella Stansberry, Megan Devall, & Caroline Brown, and the 5th place 4 x 100 team of McCormick, Stansberry, Duffey, & Brown. The boys were led by Garrett Wyeth (2nd Discus, 7th 110 H), Seth McCrady (5th Discus, 8th Shot), Drew Hurst (7th 800 & 1600) and Barrett Young (8th L J). Both the RMS Boys and Girls Track teams finished 10 at the Dwight Kane Invitational. Leading the way for the boys were Barrett Young who set a meet record in the Pole Vault at 10 feet, Garrett Wyeth 2nd in the Discus, Drew Hurst 4th in the 1600, and Mason Taylor 8th in the Pole Vault. Addison Sharp was the top scorer for the girls as she threw a personal best in the shot put to place 4th. 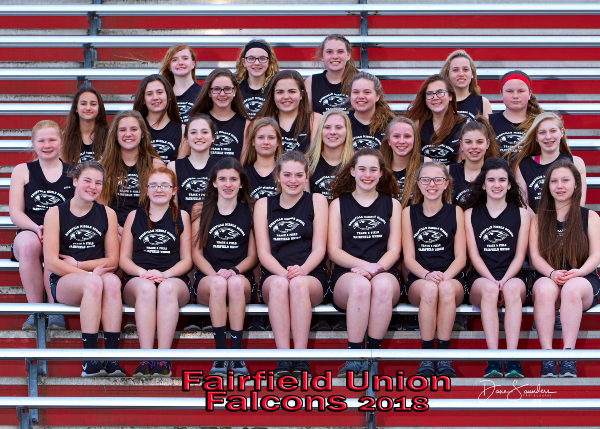 Other scorers for the girls included Niah Dehainaut (5th L J), Megan Devall 5th (Pole Vault), the 5th place 4 x 800 team of Taylor Rife, Carly Hanks, Katelin Graham, & Sarah Eyman, Alexis Cymanski (6th Pole Vault), Jayna Markwood (8th Discus), and Nella Stansberry (8th 200). The women were led by some great performances. Scoring points for the team were the following. 4x800m 2nd place, team of Heather Lecrone, Dorothy King, Morgan Runkle and Morgan Ruff. 200m 2nd place Mackenzie Lanning, 8th place Lizzi Baker 400m 2nd place Mackenzie Lanning, 6th place Lizzi Baker. 800m 1st place Madison Eyman, 2nd place Dorothy King 1600m 1st place Madison Eyman, 3rd place Morgan Ruff 3200m 1st place Heather Lecrone, 4th place Kaylee Miller. 300m Hurdles. 4th place Georgia Thomas, 8th place Lilli Young 4x100m relay 5th place team of Emma Gobert, Ava Mollendick, Ashley Miller, Emma Gobert. 4x200m relay 4th place team of Lizzi Baker, Ashley Miller, Emma Gobert, Lilli Young. 4x400m relay 1st place team of Mackenzie Lanning, Dorothy King, Madison Eyman, Georgia Thomas. HIgh Jump 6th place tie Elise Conrad and Lilli Young. Long Jump 3rd place Lilli Young. 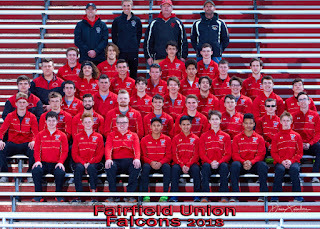 The men’s team won the 13 team invitational withe the following scoring points for the team 100m 6th place Sam Schmelzer 200m 3rd place Caleb Swick 400m 5th place Jax Kovatch 800m 1st place Cullen Dennis and 6th place AJ Ruff 1600m 5th place Brock Wagner, 7th place Bodie Hammack 3200m 5th place Ben Johns 110m Hurdles. 5th place Evan Mahler 7th place Richie Jones 300m Hurdles 1st place Chris McManaway and 5th place Will Ogg 4x100m 5th place team of Sam Schmelzer, John LaRock, Evan Rice, Caleb Swick 4x200m 4th place team of Isaac Daugherty,Chris McManaway, Evan Rice, Caleb Swick 4x400m 2nd place team of Cullen Dennis, Jax Kovatch, AJ Ruff, Chris McManaway 4x800m 1st place team of Cullen Dennis, AJ Ruff, Trent Smith, Brock Wagner. At the Boyles Supply-OU Invitational on Friday, out of 22 teams, the Girls Track team took home a 5th place finish while the boys placed 11th. 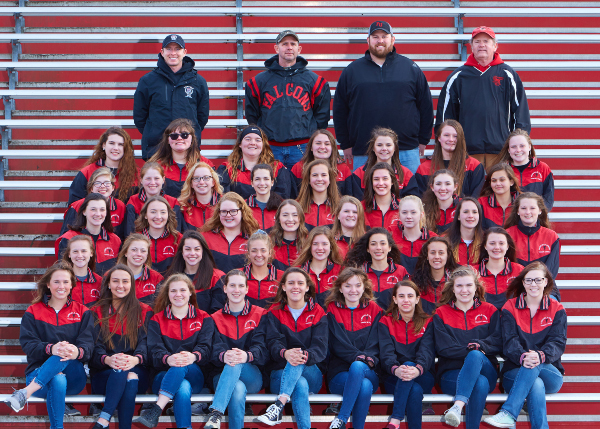 The girls were paced by Brenna Reed (3rd 800M, 4th 1600), Alexis Cymanski (3rd High Jump, 5th Pole Vault), Cambria Miller (2nd 100Hurdles), Danae Pickens (2nd Discus), Tori Lenhart (4th Shot), Olivia Carpenter (6th Shot), Megan Devall (7th Pole Vault), the 5th place 4 x 400 team of Olivia Duffey, Taylor Rife, Jillian Bennett, and Reed, & the 8th place 4 x 200 team of Nella Stansberry, Caroline Brown. Olivia McCormick, and Jillian Wilkinson. The boys scoring was done by Barrett Young (1st Pole Vault), Garrett Wyeth (6th Discus, 7th 110 Hurdles), and Drew Hurst (6th 1600m). Congratulations to both the men and women’s track and field teams for placing second place out of 8 teams. 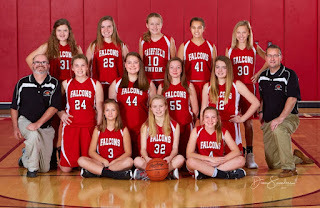 Congratulations to all the Falcons who competed at the indoor track and field state meet this past weekend. Women’s 4x800m relay placed 5th earning All Ohio honors to Mackenzie Davis, Madison Eyman, Morgan Ruff, and Dorothy King. Will Ogg was 15th place in the High Jump. Jax Kovatch was 14th place in the Pole Vault.